I want to thank all of you for your comments on my keeping it real post last week. Knowing that others understand, and go through times where they feel the same way, really does help. So thank you for taking the time to share your thoughts and struggles. Now on the some gluten free brownies, because chocolate makes everything better, right?! I love the magazine Everyday Foods from Martha Stewart Living. It is full of everyday type food with everyday ingredients. It is one of those magazines that I have subsribed to for years because I love it so much. In the last few issues Everyday Food has been sharing a gluten free recipe. It seems like everyone is jumping on the gluten free “trend” and that is a whole different subject, but the good thing about people taking notice of gluten free cooking though is the amount of gluten free recipes that are now available. When I noticed a gluten free brownie recipe in the June 2012 issue of Everyday Food I knew I needed to try it. Mainly because it did not contain any odd or unusual ingredients or gluten free flours. The only thing extra in this recipe is cornstarch, which is an ingredient in my most kitchens, not just gluten free kitchens. So, this is really a recipe that anyone can make. I did have to adapt this some for our food allergies to make it nut free. The original recipe called for 1 cup chopped toasted pecans. I left them out and the recipe worked fine, but if you are not nut free like we are I think these would be great with some nuts added to them. This recipe also calls for cinnamon and when I made these I put the cinnamon in. I actually like the taste of the cinnamon with the chocolate, but some in my family did not, so I think the cinnamon is optional depending on what you like. But no matter how you make these they are really good! 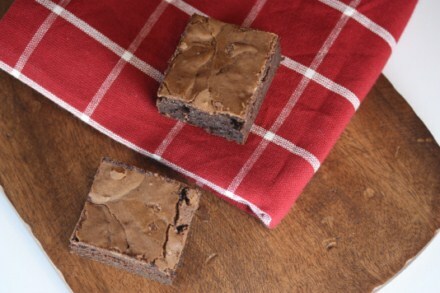 These are one of the best gluten free brownies that I have made. Pour batter into prepared pan and bake for 32-35 minutes. 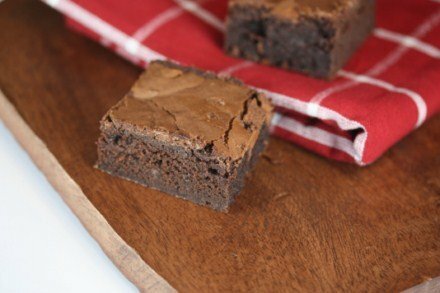 I am looking at this recipe and seeing how similar it is to my previous go-to easy brownie recipe that used one cup of flour (except for using baking chocolate [less sugar] and the extra cocoa). OK, maybe not all that similar… But what’s hitting me is that could it really be so easy as to replace a single cup of flour with 1/3 cup of corn starch? When you have the eggy-fudgy-ness for body to help you out with treats like this? Thanks for confirming my thinking, Flora. I went and looked up that recipe and it was actually only HALF cup flour, so it would be more like your substitution. I just received my issue. I can’t wait to try this recipe. Popped these in the oven this morning. Very easy and very, very delicious! Even the non-sweet tooth hubby was impressed! I threw in just over half a cup of chopped cashews and almonds for some crunch but omitted the cinammon this time. It has endless possibilites, thanks so much. Lynn, I used potato starch and it worked out great. These were very fudgy but my chocolate loving husband couldn’t be happier. Thank you for posting delicious gf and nut-free dishes!! Thanks for letting me know that it worked. I am glad that you enjoyed them! I was just curious how many servings this recipe makes. I’m having a holiday party and one of my guests requires a gluten free diet. I want to be considerate of her and thought these would be a hit with everyone! I would say 9 large brownies or 12 or so smaller ones. And yes, these will be a hit for everyone. No one will know these are gluten free. I have taken them several times to events and everyone loves them. I am making traditional Stollen for neighbors and friends this year. But, I have one friend who is gluten intolerant. So, I’ve been looking for something to bake for her—and this is it!!!!! Sounds easy—and from your description and the reviews, delicious, as well. Thanks for the recipe! I will be bookmarking your website for sure. Thanks, I hope you and your friend enjoy them. And Happy Holidays! I’d love to make these for our son who is allergic to wheat but was wondering if anyone has used substitutions for egg? He is also allergic to eggs so its been difficult to find certain recipes that he can have. I made these brownies for a family in my church and they are awesome! I may not ever make another recipe again and I don’t need to eat gluten free! Thank you for the recipe! It is delicious! I am so glad that you enjoyed them! These are one of those things that no one even knows is gluten free. Both gluten free and non gluten free people love them and they don’t contain any strange ingredients. Thanks for letting me know how much you enjoyed them! Wow! These were delicious. I have been craving brownies but was low on GF flour. These were easy to make and turned out great. Even my hubby who claims not to like brownies couldn’t keep away (he says they were not brownies but a pudding like in Brazil). Definitely a keeper.